Describe the uses of Western Red Cedar from ancient times to modern designs. Explain Western Red Cedar’s sustainability designations and pathways to LEED certifications. 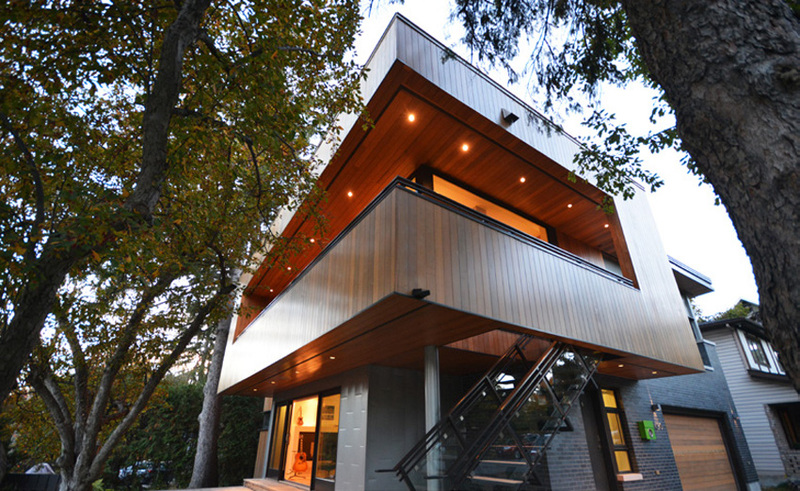 Identify design options for specifying Western Red Cedar in contemporary architecture. List Western Red Cedar’s proven performance characteristics. To understand how architects and designers can bring natural warmth to modern architecture, you need look only as far as your local Crate &Barrel store. While each of the company’s stores is different, they all have a common aesthetic feature: a warm and welcoming vibe created with clean lines and the extensive use of Western Red Cedar (WRC)—a soft, red-brown timber that has thousands of years of proven use. 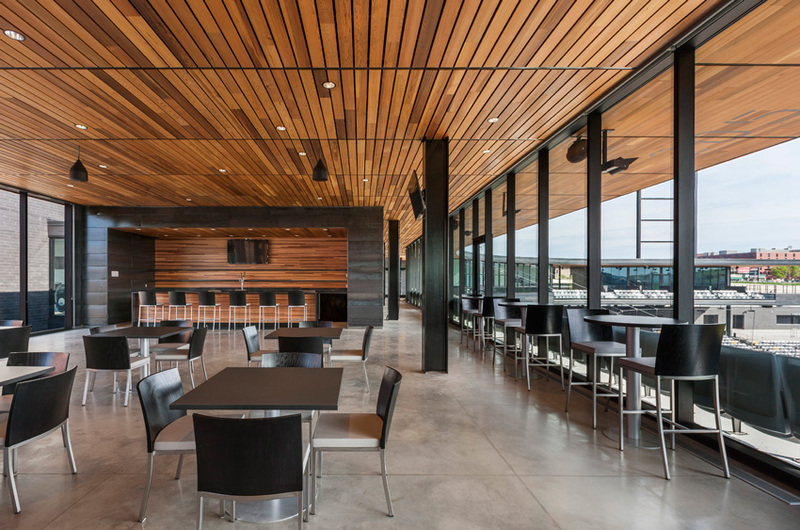 Western Red Cedar adds warmth to contemporary design at CHS Field in St. Paul. This project was designed by Ryan A+E Inc. and Snow Kreilich Architects. The cedar features specified for each store vary. “It’s used for exterior siding, interior paneling, and ceilings, and it’s stained and painted,” says Josh DeGuire, president of Specialty Wood Products (SWP), the Colorado-based company that is the sole cedar supplier for the global chain. Some of the newest Crate & Barrel outlets, all of which use Western Red Cedar as a design theme, are in such places as Russia, the Czech Republic, Dubai, and Indonesia. The wood is shipped overseas to reinforce the chain’s signature look. Although Crate & Barrel mostly uses clear cedar, a brushed, knotty cedar is increasingly used to mimic barn wood for interior accents. For example, stores in Georgia and Florida employ this design choice. Annually, Crate & Barrel uses between 100,000 and 150,000 square feet of WRC. Today’s design trends clearly indicate society’s preference for a sleek, minimalistic aesthetic. At the same time, contemporary architecture limited to glass, stone, steel, and stucco can feel cold or sterile. While clean, unembellished lines gain traction, a sense of nature via the use of wood is also sought after to evoke a connection to the natural world and a warm glow. And of importance to architects, it’s a proven sustainable material. The contemporary architectural aesthetic can feel cold or sterile, but the addition of Western Red Cedar helps overcome that. This residence was designed by Ha2 Architectural Design. As a design guideline, there is evidence to indicate that we like some wood in our architecture, without going full-on log cabin effect. For the study, hospital employees and patients were asked to rate digitally manipulated images of three rooms: one with no wood in the room; one with wood on the floor and one wall; and one with wood on all walls as well as the floor and ceiling. The preference? The room with wood on one wall and the floor was rated most pleasant, most natural, most calming, and most secure, and as the least boring room. Western Red Cedar, long revered for its durability or exterior applications, is a natural choice for also warming up interiors. Imbued with decidedly crisp yet rich tonal properties, the wood not only creates beautiful outdoor environments, it also enlivens traditional home decor, provoking cutting-edge architecture and inspiring innovative interiors. Finishes, which will be discussed later, include elegant dark stains, shabby chic bleaches, traditional solid colors, and natural semitransparent stains. Western Red Cedar also offers a wide range of sizes, surface textures, and grades appropriate for many different applications.